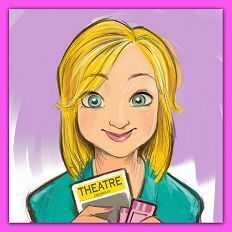 The title of Joshua Ravetch’s new play Chasing Mem’ries: A Different Kind of Musical is misleading. 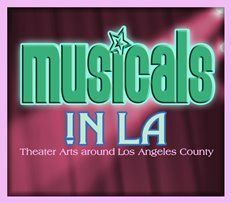 It really isn’t a musical at all, though it does contain half a dozen songs written by lyricists Marilyn and Alan Bergman. Their collaborations with composers like Marvin Hamlisch, Johnny Mandel, and Michel Legrand produced some of the most well-known hits of the ‘70s, ‘80s and ‘90s and garnered numerous awards throughout their lengthy career. “The Way We Were,” “Where Do You Start” and “Little Boy Lost,” are three such songs, all of which can be found in Ravetch’s latest work, now on stage at the Geffen Playhouse. But as beautiful as these wistful ballads are they, and the rest of the songs included in the piece, all have the same tone, tempo, and nostalgic longing within them, and that’s problematic. Rather than functioning in a storytelling capacity, they become resting points for Victoria (Tyne Daly) as she processes the pain of losing her husband of 57 years by triggering memories of long ago. Or, they linger as underscoring, which makes the piece feel even more like it’s trying to manipulate the audience’s emotional response. In both cases, the play languishes under the weight of its protracted sentimentality. Essentially, Chasing Mem’ries is a walk down memory lane that takes Victoria through all five stages of grief in the course of 90 minutes. 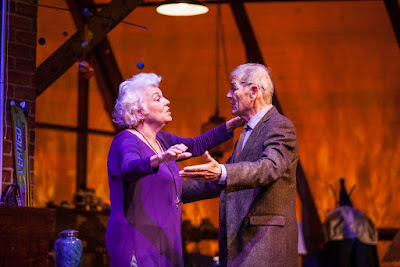 Denial, anger, bargaining, depression and acceptance each get their due, prompted by conversations with her son Mason (Scott Kradolfer) and dead husband Franklin (Robert Forster) who appears to her in the attic where Ravetch’s play is set. Victoria won’t go downstairs to the memorial service happening on the lawn because she isn’t ready to let go of him. It’s a foregone conclusion that she will by the end of the play and perhaps that is part of the challenge. We know where this story is going before it even gets started, and it doesn’t add anything new to the conversation about grief we haven’t heard before. Daly’s consummate skill as an actress is, of course, the reason to see this production and she doesn’t disappoint. 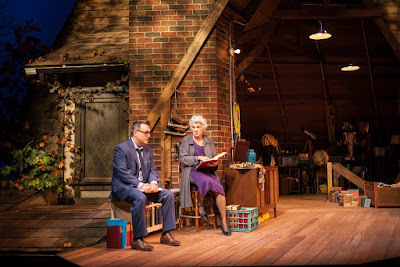 She wrings every ounce of nuance possible out of the opinionated, wise-cracking widow’s dialogue but the play still can’t shake its own sentimental death grip. Tony Fanning’s set design is a gorgeous cutaway attic stuffed with forgotten items representing a life well-lived, complete with autumn leaves trailing across the shingled roof. It’s beautiful but it makes for challenging traffic patterns, and there are times Ravetch’s staging in the cramped space is restrictive and repetitive. That may be intentional but critical moments end up feeling contrived. Watching Victoria and Franklin dance with their hands hovering inches away from each other, not touching, is odd. We know he isn’t really there but she would be able to feel him in the intimacy of the moment, particularly since this is in her mind. It’s puzzling rather than poignant because, if she couldn’t feel him, that would certainly be a source of frustration. For those who have lost a loved one, Chasing Mem’ries may conjure up memories of their own, making Victoria’s journey a cathartic one. 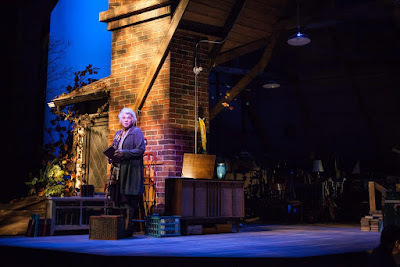 Without that connection, the play is nothing more than an old-fashioned love letter to days gone by.